I found this small piece to be a curious oddity in the Wellesley News. 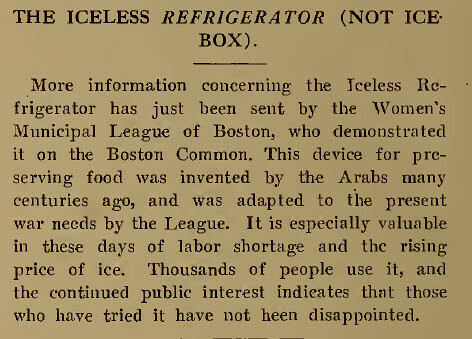 It's not the refrigerator that we come to know, but something else entirely. There's no clarity on what it is--which is interesting because today, I could google the answer and find it (which I did and found this), but how would one be able to find out more information from this simple post. The piece also makes me wonder what other things were invoked for usage during World War I to help people adapt to the shortages.